When is my Montana architect license due for renewal? 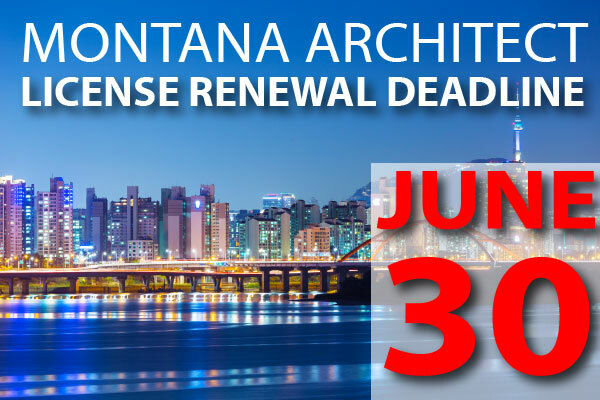 What are the Montana architect renewal requirements? In order to meet State licensing requirements, you must complete 12 Health, Safety and Welfare (HSW) hours of state-approved continuing education annually by December 31st. You can meet those requirements by taking online courses through an approved education provider. Be sure to keep a copy of your certificates of completion in a safe place. You may need them later if you're audited. How do I renew my Montana architect license? Once you've completed the required continuing education, you may renew your license online at the Montana Department of Labor & Industry website. The renewal fee is $55. Do I need to complete continuing education for my AIA membership? Yes, AIA members need to complete 18 learning unit hours including 12 hours of HSW each year. What happens if my Montana architect license lapses? If your license has lapsed you must pay all renewal and late fees as well as complete the appropriate education. Licenses that have lapsed more than two years, need to reapply for licensure. This entry was posted in Architecture and tagged Architect Renewal, Montana Architects.